For nearly four decades, Joanne’s Print Shop has proudly provided a full range of printing, copying and graphic design services to residents and business owners in Marin County, CA. With a depth of experience at our disposal, a range of print resources on hand and a dedication to quality, we’re happy to help you with your next project! Your Small but Mighty Print Shop! At Joanne’s Print Shop, we know there are a lot of printers to choose from out there. So how do you decide which one is right for you? Well, if word-of-mouth recommendations are any indication, then we’re the right place for you! In a business driven by speed and cost, what makes us stand out the most is the personal attention we give to each customer we work with. Our staff works together as a team, listens closely to your needs, responds instantly and stays true to budgets and timelines. And, our fair prices for offset and digital printing in Marin County, CA make us a contender for your business, no matter your budget! You could go anywhere for your print needs, but you’ll never find a more service-conscious partner than Joanne’s Print Shop. 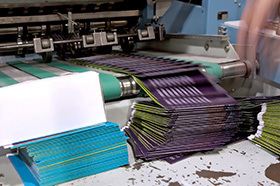 Our staff comes from a variety of printing backgrounds—from graphic design to offset printing in Marin County, CA. We know our stuff and demonstrate our knowledge and experience by turning out impressive work, time and time again. We produce your job to your exact specifications—with no run around or corners cut—to see that you get what you want, when you want it. As your provider of full-service design and printing solutions, we will help you design your printed piece or print from the ground up—whether you have existing artwork or just an idea in mind. Our goal is to keep you coming back by showcasing our focus on quality in every job we print and through every service that we provide. We’re a locally-owned and –operated business in Marin County, CA. We’re proud members of the Visual Media Alliance (VMA). Our experts can assist you with graphic design in Marin County, CA, for a quality product from conception to print. We’ve got more than 37 years of experience behind us and are continuing to keep up with industry trends today! Printing green is not a new concept at Joanne’s Print Shop—we have been printing on recycled papers for years! We have also eliminated harmful chemicals from our print process by going direct to plate. We use vegetable-based inks and paper with a high recycled content and we buy our paper from mills committed to responsible forestry and renewable resources. Our “green” commitment continues as we recycle our used plates, ink, solvents and paper waste. We’re proud to be an eco-friendly printing service in Marin County, CA! Whether you need color copies made, offset printing runs or help from a graphic designer, know that Joanne’s Print Shop is here to help! Contact us for quotes and pricing today!